Thirty people have been sentenced to death for trafficking heroin and dozens more jailed in Vietnam’s biggest ever drugs trial. 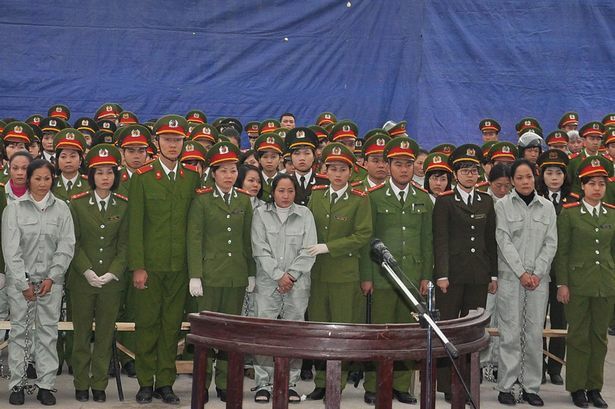 A total of 89 people were found guilty of trafficking more than 12 tons of the drug between 2006 and 2012, at a mass outdoor trial in Quang Ninh province. Thirteen people were sentenced to life in jail, while 46 others were given prison terms of up to 20 years, or warnings, the government said yesterday. The huge trial started on January 3 and prosecutors were initially seeking the death sentence for 34 people. The drugs were trafficked between China, Laos and Vietnam in various forms, including heroin and synthetic drugs. Vietnam has long been used as a location for moving heroin between Laos, Myanmar and China to other Asian countries and Australia. Anyone caught trafficking is subject to harsh punishments, which until recently included death by firing squad. The courts now uses lethal injection.